Coast Chart No. 10 Cape Cod Bay. A scarce and attractive separately issued 1880 U.S. Coast Survey nautical chart or maritime map of Cape Cod Bay. 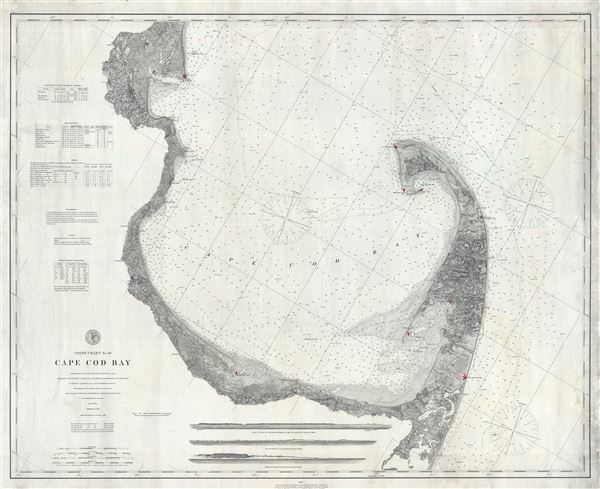 Presented on a polyconic projection, this chart follows the Massachusetts coastline from Duxbury Bay to Provincetown at the tip of Cape Cod and south as far as Nickerson's Neck. Exhibits the meticulous detail and accuracy typical of U.S. Coast Survey work of the late 19th century. Countless depth soundings are offered throughout. At the base of the map there are three land profile charts - intended to help navigators identify prominent features on distant shorelines. Locates towns and villages including Provincetown, Rock Harbor, Brewster, Barnstable, Sandwich and many more. A large number of lighthouses are shown, including Sandy Neck and the Cape Cod light on the Atlantic side. Unlike many nautical charts, this map also incorporates superb inland detail including masterful topography. The left hand quadrants of the map feature various tables, sailing instructions, notes on soundings and tides, and a wealth of other practical information for the mariner. This chart was first published in 1872, the present example has been updated to 1880 edition under the supervision of C. P. Patterson, Superintendent of the Survey. The triangulation for this chart was completed by C. M Eakn and T. J. Cram. The topography is the work of H. L. Whiting, J. B. Gluck, S. A. Gilbert, A. M Harrison, P. C. F. West, H. Adams, C. H. Boyd, and C. t. Jardella. The Hydrography was accomplished by parties under the command of CH H. McBlair, M. Woodhull, H. S. Stellwagen, and H. Mitchell. Very good condition. Minor soiling on edges. Backed with linen.